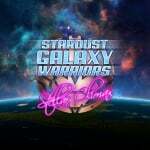 It is the year 2087, and hostile forces are causing chaos all over the galaxy, but that’s where the Galaxy Warriors come in, a mech-piloting team of five with a variety of weapons at their disposal. The plan? “I would suggest flying to the right and blowing up everything” comments one character. 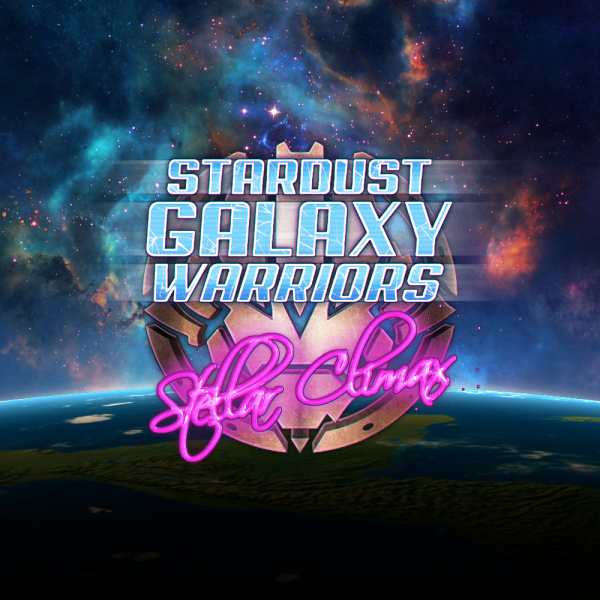 Stardust Galaxy Warriors: Stellar Climax is not a game that takes itself too seriously and other conversations will include the cost of a fourth wall and how “the most experimental” battle mech is probably the one that has been stolen because, well, that’s just what tends to happen. This is all good fun, but luckily the game has more to offer than an awareness of its own ridiculousness. It’s a solid shooter with plenty of options for tackling your quest due to its levelling system and a range of abilities. There’s no online play, but it does offer four-player local co-op. As well as the main quest, there are a few different game modes and achievements to aim for, should you wish. 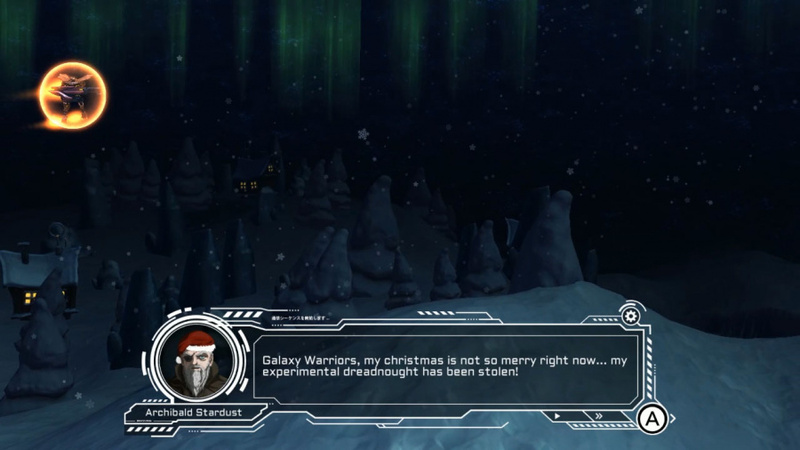 There are ten missions in the game, each divided into three levels. While these aren't jaw-droppingly impressive in a visual sense, there are some good details and a selection of sights on offer. The space-based missions manage to look distinct from each other, due to asteroids or glowing colour, while one sees you in a planet’s orbit. You’ll also be visiting planets and here you find blue waters (proceeding an underwater mission) and an alien landscape comprised of claw-like rocks and huge mushroom shapes. The streaky “Hyperspace” stage is a simple but effective environment, while the 3D backdrops to other stages have a good sense of depth to them. You have primary and secondary weapons, a sword (useful for overhead enemies) and a special ability, plus another useful attack that charges up over time. 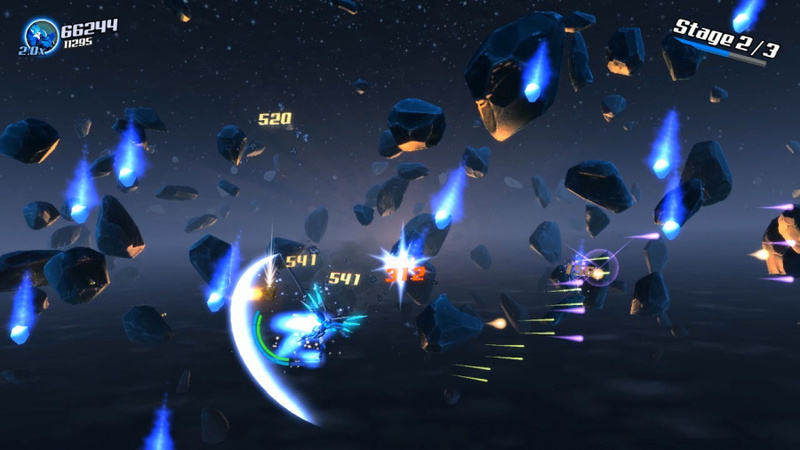 Slashing swords, whooshing rockets, lasers and a variety of other attacks come from the player characters, whilst the enemies chip in with moves of their own. Amongst other things, bullets of different colours rain and spiral across the screen, making for a quite hypnotic kaleidoscope of action that remarkably remains easy to follow thanks to distinct designs and a good use of colour. This is organised chaos. Occasionally, missiles and projectiles from the drones you can collect look similar to those from the current crop of enemies. Potentially this can lead to damage from a missile that, contrary to your initial impression, wasn’t actually one of yours. Still, the game runs smoothly for the most part, with exceptions being some of the larger bosses where there is a small, but noticeable pause when they arrive on the scene. Some boss and sub-boss encounters are wacky affairs, with one "blast from the past" bunch providing a neat spin on Space Invaders. Another features a revenge subplot, while others are large constructions requiring plenty of hits to destroy and also requiring you to dart about the screen avoiding the multitude of dangers fired in your direction. The audio impresses with a bunch of zings, pops and roaring flames from the weapons as well as explosions and the impact sounds when attacked; these are crunchier when they get through your shields. Backing the action is an electronic soundtrack that offers quite a range of tracks, one seeming using Street Fighter II as a jumping-off point, another the classic rock band Queen. Sometimes mysterious, other times intense, part space adventure, part night out at a rave, these tracks work very well with the on-screen action. Said on-screen action consists of blasting (or maybe slashing) a number of different enemy types into oblivion. There are various ship designs and sizes. Some of the smaller ones are quite nippy, while others will turn to decrease their hit-box size. The larger craft (which can be much larger) are harder to miss, but naturally, take a greater number of hits to dispose of. You have a regenerating shield, but so do some of the enemies that can cause trouble if you don’t break down that protection quickly. As well as ships, you’ll be battling bug and snake-like creatures and contending with laser beams, sometimes just a barrier, other times rotating and in both instances threatening to shred your mech to pieces. Prior to each mission, you get to pick your character. There’s five on offer and as well as visual differences, each possesses a couple of unique abilities. Their special moves (available at any time) include a dash move that also doubles as a useful evasion technique, a melee attack that can restore your own armour and an absorbing ability to draw in enemy fire which can then be repurposed to unleash a charged blast. In addition to this, each character has “Distortion tech” that charges up as you play. 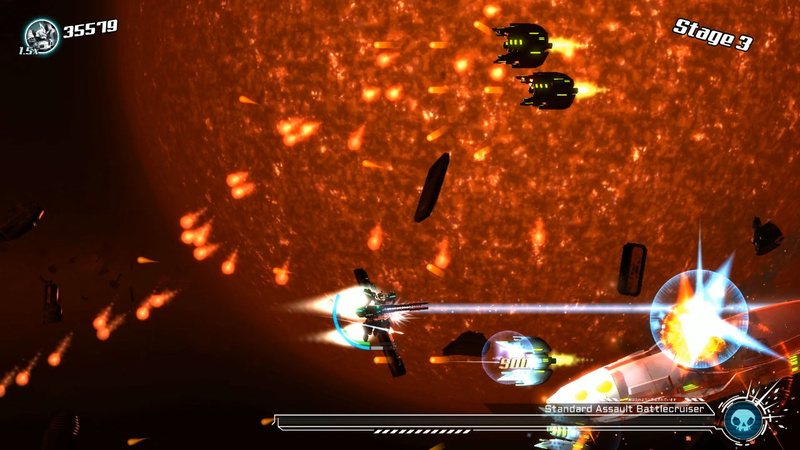 Some characters can then unleash another weapon attack such as a bomb blast or a missile barrage, but one character can briefly slow down time, whilst another can make all players temporarily invulnerable. There are options for your standard weapons too, with seven primary weapons including the likes of rapid-fire, shotgun-like and triple shot. 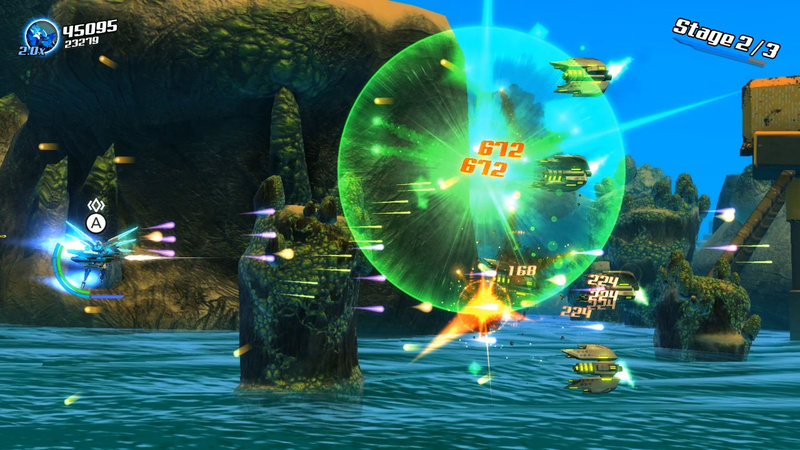 The secondary weapon is more of a missile attack and again, there are seven options including homing missiles and a devastating, but less accurate attack. With all these different attacks, armour and auto-recharging shields, you might expect the game to be a pushover, but you can easily be overwhelmed by enemies should you fail to use the right technique at the right time. Additionally, larger groups and more powerful attackers increase in number the further you get into the game. Off-setting this somewhat is the game’s levelling system. After each of the first two levels, you get to choose an attribute to level-up. 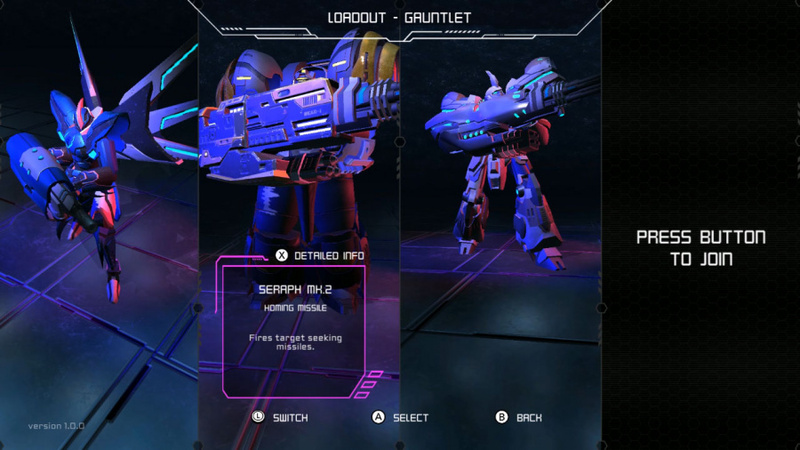 There are three to choose from, offering various weapon and defence buffs, with the specific options varying each time. 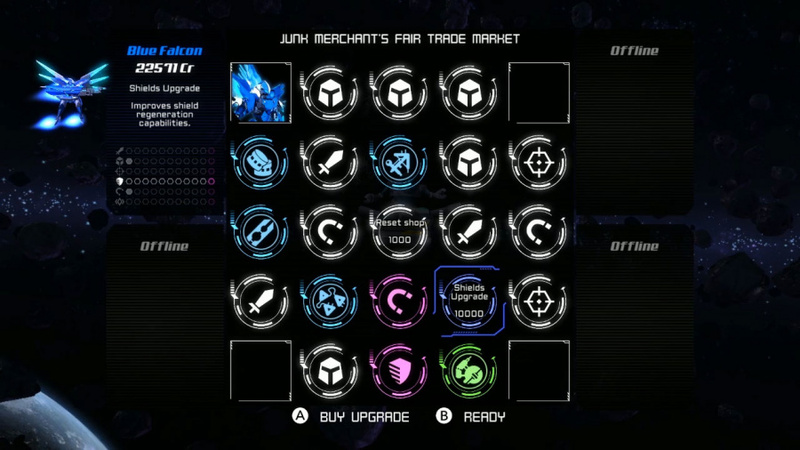 After the third level of the missions, you are approached by a junk merchant who will sell you further upgrades using the credit accrued during gameplay. There’s a greater range available (although these too rotate) and this includes some additional items, like the one which will increase your armour at the expense of a speed nerf. How you choose to upgrade is up to you, so you could level everything relatively equally, but if you avoid bullets like big companies avoid tax, maybe you could ignore defensive upgrades in favour of beefing up your destructive firepower. Finding an upgrade strategy that works for you is useful, but it doesn’t remove the challenge from the game. You however can. This is a game that can be tough, but it is one that developer Dreamloop Games is keen for players to experience all the way through. Consequently, there are two difficulties below the default: “cadet” and “Sunday stroll” to make it a bit easier by lowering enemy health and fire rate. You can also create your own custom settings if you’re still struggling, adjusting bullet speeds, hitboxes, respawn rates and much more. You can, of course, also use this to increase the difficulty or craft your own challenges, with the game including a few presets of its own for you to try out. Whether playing through for the first time, tackling it with friends or replaying to try things a different way and/or hunt for achievements, it’s a lot of fun, but there’s also some other modes to sink your teeth in to. "Gauntlet" and "Strike" are both endless survival modes of increasing difficulty (the latter offers upgrades) where you simply hope to survive as long as possible and rack up a high score. This offers great replay value, although sadly there's no online leaderboard. "Challenge" meanwhile has five multi-level pre-designed challenges (no adjustable difficulty) that can feature a focus on evasion or speed. Naturally, there’s a Boss challenge, while the “Battle Square Challenge” is an eight-stage affair that throws in a random handicap with each round, such as reducing your shields or slowing down your movement. Granted, the Switch certainly isn't short of shooters (or even decent shooters, for that matter), but Stardust Galaxy Warriors: Stellar Climax nevertheless is worth a look; it's an incredibly fun and action-packed game that you can enjoy with up to three friends and boasts plenty of options that can be tweaked to make the experience as easy or challenging as you'd like. Throw in some engaging extra modes, great presentation and a healthy dose of self-aware humour and you've got a package that will keep you entertained for quite some time. Fans of the genre should definitely check this one out. Nasty flash looking visuals and totally average gameplay its a 8 great. It supports 4 player co-op. Shmup fan? Have friends who like to hang around your Switch? Buy it and enjoy. Not a shmup fan? Carry on my wayward son. This is quite a solid game. I have a few complaints...characters don't offer enough differences in the way they play, levels need more stationary baddies (like turrets on walls) and environmental hazards, bullets are too pattern-based and bullet-hell-y. But overall I am pleased. Definitely a 7 or an 8. The analog control is truly outstanding and precise. I watched some gameplay of this a couple weeks ago and found it to be an absolutely snore-fest, and I love shoot ‘em ups! One of my favorite shmups. The price is making me want to double dip just because I find the game very replayable and I would find it even more so on a handheld. I just like the variety. Many different types of weapons that you can use in any combination make it more engaging than the average shooter that just gives you a mildly different gun per craft (if there is even more than one). This seemed like it was right up my alley, so I backlogged it. Easy to fly under the radar, but quality enough that I shouldn't miss it. Good to hear it's fun to play, cause co-op and humorous was a winner for me. This is getting mega - buried by Smash hype. I don't normally care for SHMUPs, but the humor, adjustable difficulty, and good replay value make this one an exception for me. The last 2 months were really great for shmup fans with Black Bird, Strikers 1945 Plus, Super Hydorah, Rival Megagun, Astebreed, Twinkle Star Sprites and this one. I strongly recommend Black Bird.